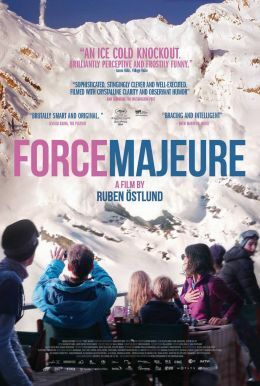 A critical favorite at this year's Cannes Festival, where it took the Jury Prize in Un Certain Regard, this wickedly funny and precisely observed psychodrama tells the story of a model Swedish family—handsome businessman Tomas, his willowy wife Ebba and their two blond children—on a skiing holiday in the French Alps. The sun is shining and the slopes are spectacular, but during a lunch at a mountainside restaurant, an avalanche suddenly bears down on the happy diners. With people fleeing in all directions and his wife and children in state of panic, Tomas makes a decision that will shake his marriage to its core and leave him struggling to reclaim his role as family patriarch.